I run Skyware Press, a small publishing business, with my husband Tony Grogan. We specialise in producing guide books to long distance trails in the Yorkshire Dales and Cumbria, and to walks from the Settle Carlisle railway line. It all started when we had the idea of creating a long distance route ourselves. We spent 2007 walking in the Western Dales, land of the Yorkshire 3 Peaks, devising a 90 mile walk from the historic mill village of Saltaire through the Dales and Eden Valley to Appleby-in-Westmorland. 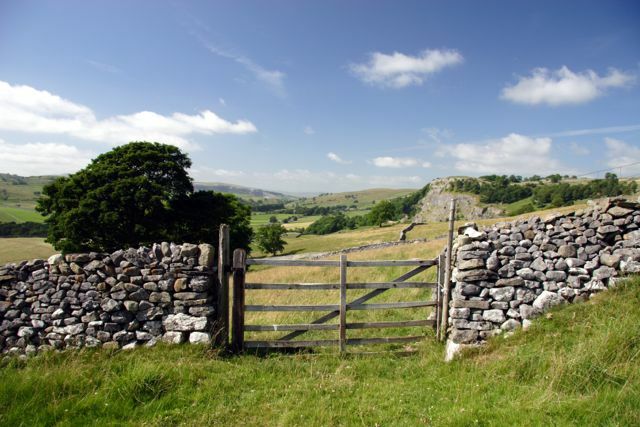 In 2008 we published A Dales High Way Route Guide and the rest, as they say, is history. I go for walks in the glorious Yorkshire Dales then write about them to encourage other people to discover them too. That’s a job description that would make anybody happy. We’re quite small and we’ve built up a great relationship with many of our customers. We know the routes we publish and can answer questions about them. We also share walkers’ experiences on our websites and through social media. We are also very proud that we don’t send our books halfway round the world to be printed. We use a Yorkshire printer, Briggs Bros of Cononley, who use carbon balanced paper from responsible sources. If they are a walker, I’d suggest they followed one of my favourite walks. It climbs out of Settle to Sugar Loaf Hill then passes beneath the beautiful limestone scars of Warrendale Knotts and Attermire Scar with its fascinating caves. From there on a clear day they will see all 3 of the Yorkshire Three Peaks with the Lakeland Fells in the far distance. Nothing will feel quite so bad after that. After passing the hidden waterfalls at Catrigg Force the path drops to the pretty village of Stainforth, returning along the banks of the river Ribble on the route of A Dales High Way to Settle where great pubs, cafes and plenty of Yorkshire hospitality await. A perfect day out. 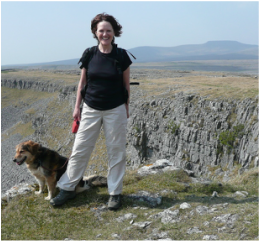 I’d recommend they chose 2 days during the Ride2stride Walking Festival when they could take a trip on the fabulous Settle Carlisle railway line then join a walk led by experienced walk leaders who would take them to places they may never find alone. All the walks end at a pub where there is food and drink to be bought and free entertainment from local musicians. One of my own personal favourites is the Station Inn at Ribblehead where the Saturday night crowd is one of the liveliest of the whole Festival. Dentdale, the most westerly and in my mind the most beautiful of all the Yorkshire Dales. I grew up on a farm at the top of the dale and for me Dent will always be home. I walk my dog Jess every day and I love spotting the tiny clues that signify the changing of the year. The first rays of light in the January sky, the sound of the woodpecker tapping away in the woods, a whiff of wild garlic that tell us that spring is on its way and we’ll soon be back out on the hills. Is a local person who you think embodies the Yorkshire Dales spirit - and why? My hero and mentor Colin Speakman. Colin created the wonderful Dales Way walk almost 50 years ago. It was the first long distance path we walked and is still for many people their introduction not only to the joys of a walking holiday but to the beauty of the Yorkshire Dales. Colin continues to walk and to talk and write about his beloved Yorkshire. He is the author of over 40 books, a tireless campaigner for public transport in rural areas and I’m proud to know him.